Enjoy streaming media content on nearly any HDTV with the Amazon Fire TV Stick Streaming Media Player. It provides access to content such as movies, TV shows, music, games, and more. You can also access premium services such as Netflix, Pandora, HBO NOW, and Amazon Video. This device supports video resolutions up to 1080p and connects to your TV via its integrated HDMI connector. For high-speed Internet connectivity, the Fire TV Stick is equipped with dual-band 802.11a/b/g/n/ac Wi-Fi. You can also wirelessly mirror and share content from your compatible smart devices. Using Alexa voice technology, you can intuitively navigate the Fire TV and search the web for additional information, such as the weather and sports scores, by simply speaking into the included Alexa voice remote control. Fast and fluid content browsing is enabled by the device's quad-core processor. It has 1GB of RAM for multi-tasking and 8GB of built-in storage. 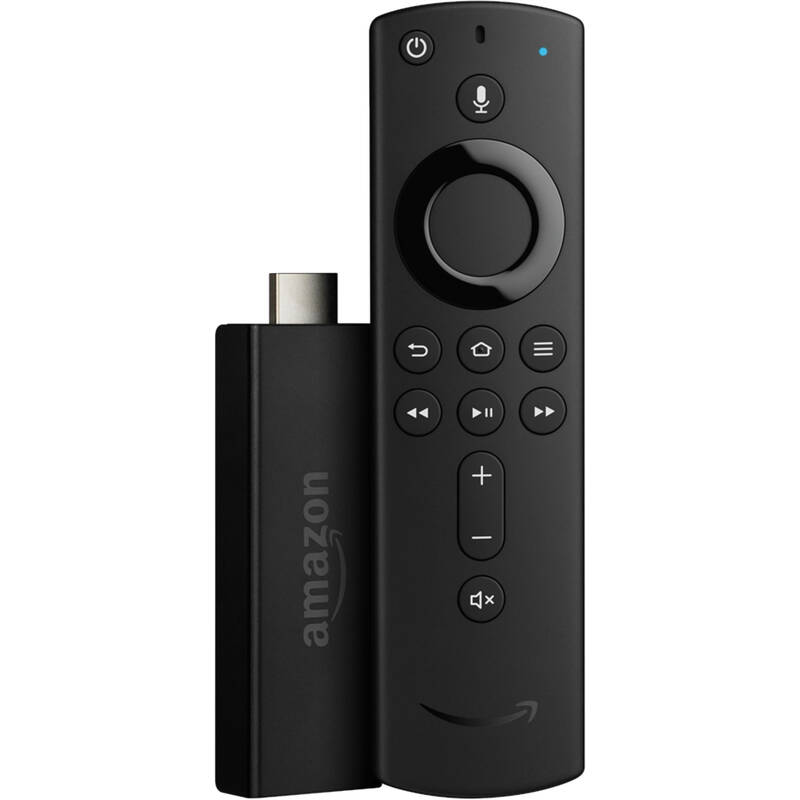 In addition to using the included Alexa voice remote control, you can also download the free Fire TV remote app for compatible Fire, Android, and iOS smartphones and tablets for enhanced control. Just plug the Fire TV Stick into your HDTV and start streaming in minutes. Use the included Alexa Voice Remote to find how to watch across more than 90 channels and apps with universal search. With access to Netflix, Hulu, HBO NOW, YouTube, Amazon Video, and more, there are over 300,000 TV episodes and movies ready to stream. Watch live TV (including sports and news) as it happens. Use the Alexa Voice Remote to find what you want to watch. Just say, "Find romantic comedies," and Alexa will show you results from apps like Netflix, Hulu, HBO NOW, and Amazon Video. Want to skip the opening credits? Say, "Fast forward a minute," within Amazon Video and Amazon Channels. Alexa, the brain behind Amazon Echo, doesn't stop there. Just press the microphone button and ask to play music from Pandora, order a pizza from Domino's, and more. Watch TV live with subscriptions to Sling TV, CBS All Access, NBC News, and others. Learn how to stream your favorite shows without a cable subscription (internet service required), and find out which apps you need using the interactive guide. Never miss an episode when you're away from home. The Fire TV Stick works with any HDTV so you can take it to a friend's house or bring it along to hotels and dorm rooms. Just plug and play anywhere – all you need is a Wi-Fi connection, an HDTV with an HDMI input, and an available power outlet. Millions of songs are available to stream on Fire TV Stick through Pandora, Amazon Music, and iHeartRadio. Just press the microphone button on the Alexa Voice Remote and say what you'd like to hear next. Plus, you can watch videos from YouTube, Vevo, and Vimeo. Box Dimensions (LxWxH) 5.6 x 3.5 x 1.5"
Fire TV Stick Streaming Media Player with Alexa Voice Remote is rated 4.7 out of 5 by 64. Rated 5 out of 5 by Anonymous from FireTVstick - possibly the best under $50 ever purchased Love this. I especially love Amazon Prime. Last night we watched the first in the new series of Jeremy Clarkson's Grand Tour. It's worth purchasing JUST for this one series. Of course this is the best way to get KODI with all its thousands of latest movies, box-sets, TV Shows, Live Soccer Games. Just brilliant product. Rated 4 out of 5 by lindalautrec from Great but hard to set up! I signed up for Amazon Prime on a whim. The salesman told me that you just plug it in, can even speak your requests, and watch all sorts of movies...and that you can ask the weather, etc. It took me days to get it to pair with my TV. I had to read many different web instructions and watch youtube videos. I was just about to return it when ...lo and behold...it worked. I still don't know how to do anything else on it. Definitely worth the money...but not a "plug and go" device. You decide. Rated 5 out of 5 by WP from Turn an old TV into a Smart TV We have a flatscreen TV that is 10 years old. We have been thinking of replacing it with a newer Smart TV. However, we got a Fire Stick and turned our old TV into a Smart TV. It plays movies, music, Utube Videos, etc. all without us having to spend money replacing anything. The setup is quick and easy. The best thing about the Fire Stick is that you just tell it what you want and it's done! If you can use Siri - then you can use the Fire Stick! Rated 5 out of 5 by Anonymous from Great, and you can't beat the price. Using it for Kodi Media Center, and it's well worth the price. Handles video much better than the Raspberry Pi in this case, and it's much cheaper. As a bonus, you don't have to shell out for the extra codecs you would on the RPi. Rated 3 out of 5 by Anonymous from Decent, but maybe get the full tv box instead Excellent for streaming services: Netflix, Youtube, Sling, etc.. I have constant issues with Plex & KODI/SPMC which makes me fairly unimpressed with the device, but it is only a 1gb device. Rated 4 out of 5 by Breck from One best have HIGH SPEED internet A good product, alas not exactly?as advertised by Amazon.? Having installed it, all of a sudden if I want this program?or that I needed to pay additional dollars.? It would behoove you to understand?that it requires a Firestick for each TV unless you want to move it from room to room. On the plus side, one can kiss their?cable company goodbye which saves 100's of Dollars over the year.? Pay once and NEVER pay again One is probably better off with the Firestick TV model, also available from B&H. Rated 5 out of 5 by DaveB from Great device! The new fire tv sticks are much faster than the older model. This thing just works. No issues, no lag with live tv streaming. Has tons of apps you can install. Doesn't needed rebooted often. Amazon is always keeping the device up to date. I was once a Roku person but I'll stay with the Fire now and have totally switched all my devices over to the Fire. It's an Android operating system just like a phone per say. You will need 3 devices. One for each TV. what band width do you need? Many available apps may not be offered or functional in Australia. Why does it limit me to two when this is not stated anywhere on the page? I apologize for the inconvenience. Quantity limitations vary, depending on inventory, and this cannot always be reflected on the product page quickly enough. Typically, if you change the quantity on that main page, before adding to cart, you will receive a message immediately. how do you plug it up? Insert into your television's HDMI port and USB port. Or you may use the included AC adapter instead of the USB cable. How many do you need for 3 TVs? You will 3 devices. One for each TV.